Yeah, this Wednesday, 8th November, 2017 is going to be another time for our Website Design Workshop. For a while now, we have been seriously exploring different means of generating traffic especially leveraging on social media. But you know how it is with social media? Social media is so vast and it will be so crazy for you to keep posting manually on the several social media that are available for you to generate traffic to your site. Therefore, I just came up with some fantastic solutions that will help you to generate massive traffic with your website. Take note of what I wrote, please, “generate traffic with your website”. I mean, your website will become the traffic power engine that will attract hundreds to thousands of visitors to itself while you can sit back and watch your sales and leads skyrocket. To make this happen, you definitely need a website. Your website is the most important tool here. You need to get a WordPress website to perform this impressive feat. Therefore, your first line of action is to learn how to design a WordPress website. You see, I discovered that the reason for high rate of failure in online business is inability for most business owners to generate traffic. Therefore, I have been doing serious research for the past 2 months to see how to resolve the problem permanently in a stress-free way that will cost little or nothing most especially for our MeritChoice Millionaires’ Mentorship Academy (MEMMA) students. The reliable solution that I found out is through WordPress Website. My initial intention is to continue teaching about how to generate traffic but I see the need for anyone that wants to implement the traffic idea to understand how to design website and use WordPress proficiently since it is now becoming the power engine we will be using to generate traffic across social media platforms. I will therefore want you to attend the Website and Blog Design Workshop coming up this Wednesday, 8th November, 2017 by 10am where you will learn how to setup your online money making website. With your website, you will be able to display your products and services to the world and also be able to start driving traffic with it, almost on autopilot. Click here now to register for the training. 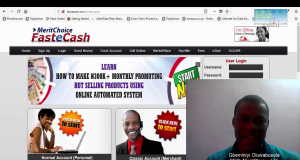 After the Wednesday training, then prepare for Saturday, 11th November, 2017 where you will learn how to setup your website to start helping you to generate unending traffic. This is going to be a complete training and solution just get your online business bringing in the profit. Make sure you follow us through email, website and all our social media for details of all these training and helpful solutions. We are already using these ideas massively. Click here to instantly start the training online. Previous: It’s November – How Does It Feel To Be At The 11th Month of 2017?